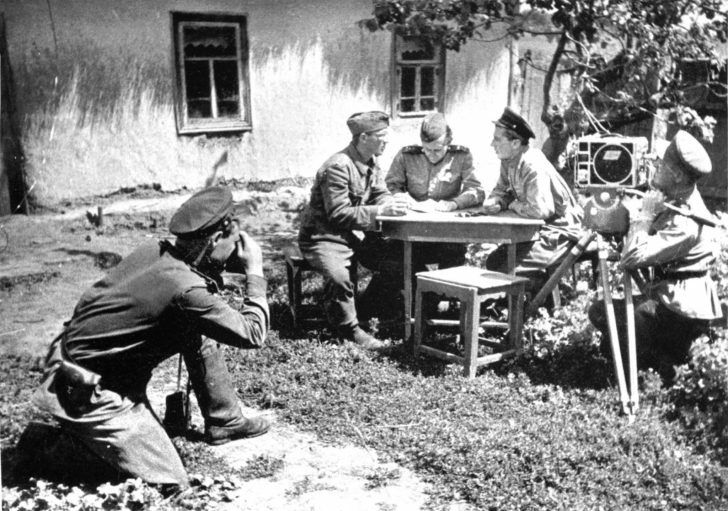 Oleg Knorring, a photo correspondent for the Krasnaya Zvezda newspaper, and Ivan Malov, a cameraman, are filming the interrogation of the prisoner Obergefreiter Alphonse Baumhor from the 5th company of the 157th Infantry Regiment of the 86th Infantry Division of the Wehrmacht, who voluntarily switched to the Red Army at 20 o’clock on July 6, 1943 of the year. Captain S. Mironov (right) and translator Iones (center) lead the interrogation. Central Front, Orel-Kursk direction.